The author feels that he is capable of writing a true and unvarnished history of "Billy the Kid," as he was personally acquainted with him, and assisted in his capture, by furnishing Sheriff Pat Garrett with three of his fighting cowboys--Jas. H. East, Lee Hall and Lon Chambers. 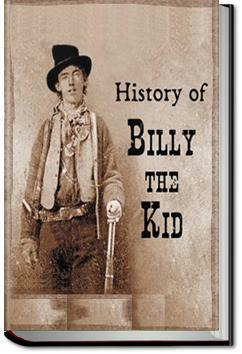 The facts set down in this narrative were gotten from the lips of "Billy the Kid," himself, and from such men as Pat Garrett, John W. Poe, Kip McKinnie, Charlie Wall, the Coe brothers, Tom O'Phalliard, Henry Brown, John Middleton, Martin Chavez, and Ash Upson. All these men took an active part, for or against, the "Kid." Ash Upson had known him from childhood, and was considered one of the family, for several years, in his mother's home. . . .Segura was shackled and handcuffed. In the rear of the jail building there was another guard asleep. He was relieved of his fire-arms and dagger. When Segura was free of irons the two guards were gagged so they couldn’t give an alarm, and chained to a post. The two outlaws started out in the darkest part of the night, just before day, Segura on “Gray” and the “Kid” trotting by his side, afoot. An hour later the two desperadoes were at a confederate’s ranch across the Rio Grande river, in Old Mexico. After filling up with a hot breakfast, the “Kid” was soon asleep, while Segura kept watch for officers. The “Kid’s” noble “Gray” was fed and[Pg 22] with a mustang, kept hidden out in the brush. Now the ranchman rode into San Elizario to post himself on the jail break.